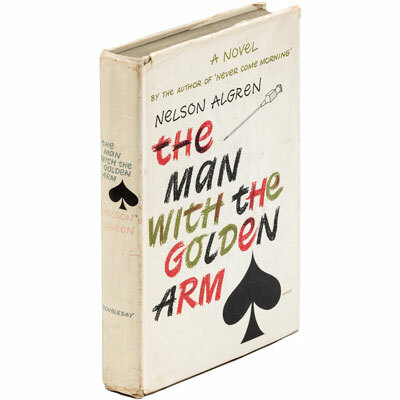 Algren’s shockingly brilliant novel of the disinherited, The Man With the Golden Arm tells the sordid tale of Frankie Machine, the ‘golden arm’ dealer of a back street Chicago gambling den, whose heroin addiction and failing marriage drive him to the depths of despair. The character of Frankie Machine was memorably brought to life on the silver screen by Frank Sinatra, in Otto Preminger’s 1955 film adaption of the novel, which co-starred Kim Novak and Eleanor Parker. Algren’s tragicomic, picaresque account of young Texan Dove Linkhorn’s adventures as a hobo, hustler, stud, prisoner, and victim, as he traverses the shady corners of Old Perdido Street, in the French Quarter of 1930s New Orleans. Little Joe never once gave it away, Everybody had to pay and pay, A hustle here and a hustle there, New York City is the place where they said: Hey babe, take a walk on the Wild Side. A rare little early 19th century work on deserts, pickles, relish and wine. Chapters are: Drying and Candying; Lozenges and Confits, Cakes, Biscuits, etc. 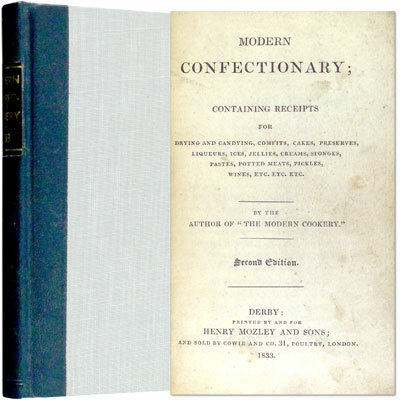 ; Puddings; Preserves; Sirups, Liqueurs, and Waters; Ices; Jellies; Creams, Custards, etc. ; Sponges; Patties, Pastes, etc. ; Potted Meats; Pickles, Catsups, etc. ; Observations on British Wine. So begins the preface of the Chicago Record Cook Book. Comprised of 1,100 recipes from homemakers, which has a single bill of fare for every day of the year. A handsome and large (35.5 x 27.5 cm) folio album of photographs of sea side places around the coast of England and Ireland, including Dover, Brighton, Guernsey, Plymouth, and Scarborough, among many others, profusely illustrated throughout with 284 photographs, descriptive passages accompanying each one. A rare near fine first edition of this highlight of 1920’s crime fiction, and according to Julian Symons in Bloody Murder, 'one of the most stunning trick stories in the history of detective fiction'. Joan Bendix is killed by a poisoned box of liqueur chocolates that cannot have been intended for her to eat. The police investigation rapidly reaches a dead end. Chief Inspector Moresby calls on Roger Sheringham and his Crimes Circle – six amateur but intrepid detectives – to consider the case. The evidence is laid before the Circle and the members take it in turn to offer a solution. Each is more convincing than the last, slowly filling in the pieces of the puzzle, until the dazzling conclusion. ‘A notable tour de force with no less than six separate solutions, and a veritable textbook of the literature’. – Howard Haycraft, Murder for Pleasure.